‘Guarding naturally over mother earth’. Welcome to Christchurch’s Botanic Gardens – the best representation of Christchurch as the Garden City! From the old Peacock Fountain to the new Visitor Centre and ilex Cafe, there’s a lot to see and do. The children’s playground is always a winner. Keep an eye out for activities in the school holidays such as nature trails, gnome hunts, and more. Speaking of gnomes, have you seen the little guy to the right? 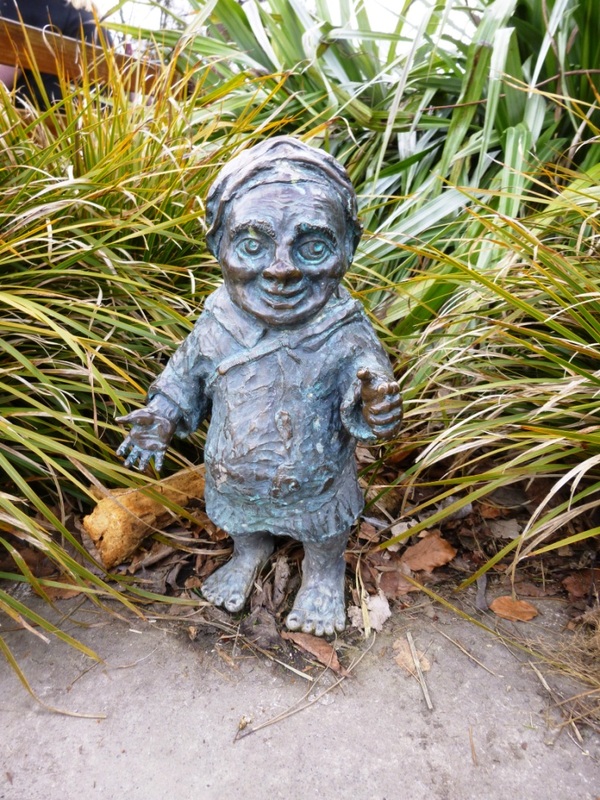 He’s solid brass, and marks the international year of the gnome. Of course, there are lots of gardens and trails to explore. Paths are a mix of smooth and stony, so some are better than others for scooting. All are OK for buggies – just watch out for the odd set of steps. Check out the interesting and quirky art installations throughout the gardens. Take pause at the Peace Bell and wander past the water gardens. The daffodils, magnolias, and cherry blossoms are amazing in spring, and in autumn you can’t beat a good play in the leaves. Summer is the time to hit the paddling pool and grab an ice cream. We visited the the Botanic Gardens in September 2015 (spring). See below for location and access. Pond near the old Tea Kiosk and old visitor centre. Bridge access from the Armagh St car park. Reminds me of Reece’s Pieces for some reason! The main entrances to the Gardens are off Park Terrace (enter the car park over the Armagh St bridge), and Riccarton Avenue (enter the car park at the Hagley Park Tennis Club). There are toilets in the children’s playground area and the Visitor Centre.